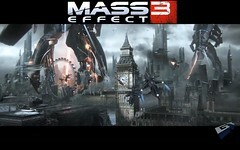 The Mass Effect 3 (ME3) demo was released just on valentines day. So it surely kept those who are single, and Mass Effect fans busy while others went out on their “dates”. I finally downloaded the demo to my Xbox and got a chance to play it. My first thoughts on the demo are WOW!! Not only sooner does BioWare instantly up the thrill of the game than right at the start. BioWare gave players the chance to just jump in and play (action) or to have a chance to see the new customizable options for the characters (role playing). I recently have been playing through ME1 with a character I am choosing to continue through all the games. So after playing through the ME3 demo I see that some of the decisions you make, like if Ashley Williams dies or not, will effect into ME3 as they have in ME2. Also, I will add, that the graphics are amazing. Shepard looks stunting in this game even as a female. The demo starts as Shepard in his room looking out the window, looking at a little boy playing with his toy ship. Then Shepard gets summoned by James Vega (new character) to follow him. You run into your old friend Captain Anderson. Before you know you are in the middle of a meeting explaining to a council about the ruthlessness of the Reaper. When all of the sudden in the middle of the meeting the Reapers come crashing down onto Earth’s surface. The ships crawling along shooting lasers into the building. Shepard dodges flying debris. Now Shepard and Anderson must make it towards the Normandy to begin the story of Mass Effect 3. The combat in ME3 is definitely smooth. It is much improved from Mass Effect 2. After boarding the Normandy you are forwarded to a mission where you really see how the combat system is in ME3. You are to collect the female Krogan safely so you can gain the help of the Krogans, with the battle against the Reapers. Wrex, Garrus, and Liara (characters from ME1, and some from ME2) assist Shepard in this mission. Shepard and his team must extract the female Krogan before Cerbrus gets their hands on her. The look and feel of ME3 is different but improved from the past Mass Effect’s. Shepard has seen and done a lot up until now. So he/she is no novice in battle. BioWare was definitely not shy in creating this edition. Close combat in Mas Effects past was not to get involved in close combat. With Mass Effect 3 close combat is only enhanced Shepard’s ability to a stoppable force like say, Rambo or dare I say it, Chuck Norris. But seriously here is what BioWare is introducing new to the genre. Grenades are back and are more improved than ever before; the original Mass Effect. ~ by rjslick88 on February 17, 2012.